There’s no doubt that Stella Artois shines during the holiday season and they are no strangers to lending a helping hand to those who need us most during this time. Please help us make a positive impact in our communities and help put a dent in hunger this holiday season. 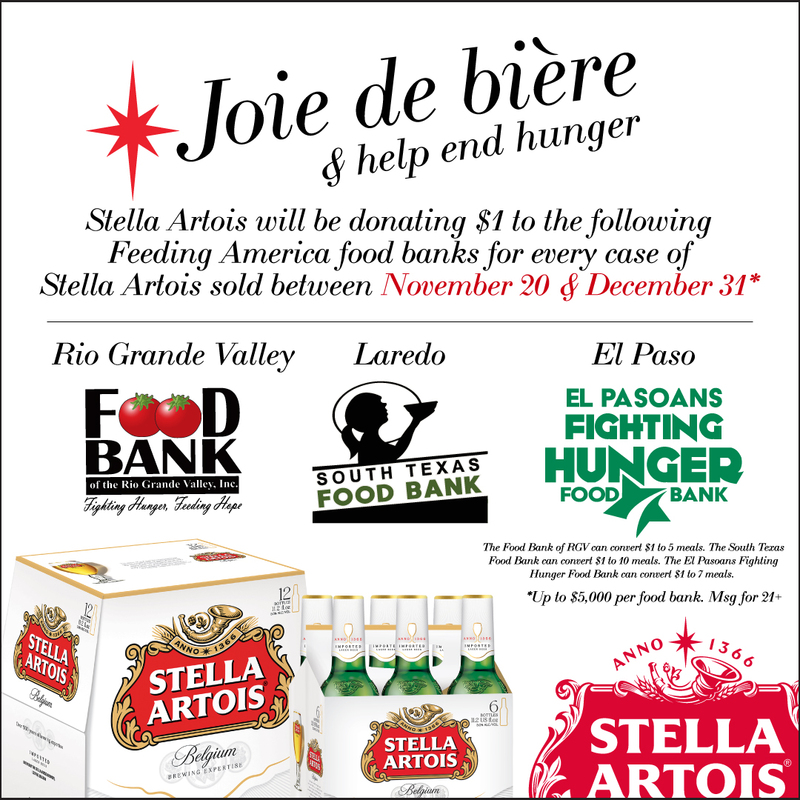 Starting on Tuesday, November 20, Stella Artois will donate $1 to the Feeding America™ food banks in our L&F communities for every case of Stella Artois sold till the end of this year. Be it 6-pk, 12-pk, glass or bottle, every case counts, so be sure you pick up a case at your local retailer or have yourself a well-deserved drink at participating bars and restaurants. The three food banks are able to maximize the conversion of $1 as best as they can. The Food Bank of the Rio Grande Valley can serve 5 meals for every $1. The South Texas Food Bank of Laredo is able to serve 10 meals for every $1. The El Pasoans Fighting Hunger Food Bank is able to serve 7 meals for every $1. If you’re interested in being of extra help you can learn how to get involved by visiting their websites, which are provided below. Have a great Thanksgiving and joie de bière! Click on the following links to be directed to the food banks’ home pages.